During the deliberation of the Department of Health budget held in the Senate on November 14, Senate President Vicente "Tito" Sotto was able to ask the FDA and DOH regarding the case of Dr. Farrah. For everyone else knowledge about Dr. Farrah, her Natural Medical Center in Tarlac was closed by authorities and was accused of selling unauthorized supplements. Her clinic was temporarily close for outpatient clinic. On October 2018, Dr. Farrah wrote an open letter to President Rodrigo Duterte regarding her clinic and plead to help her in continuously helping her patients. Food and Drug Administration officials raided and closed Bunch's Natural Medical Center in Victoria, Tarlac. The wellness center was known for supplements which allegedly helped in the treatment of cancer, arthritis, and other illnesses. During the deliberation, Senate President Tito Sotto asked DOH Usec. Eric Domingo regarding the case of Dr. Farrah Agustin-Bunch on her case. Sotto questioned, why shutdown the medical center of Dr. Farrah, if many patients have been benefited by her clinic and medicine. "Maganda nag benepisyo, maganda nagiging resulta. Registered naman siya sa inyo.. Ang nagrereklamo lang ay mga medical societies. Bakit yung mga albularyo, hindi nila nirereklamo. Bakit yung marami ang nakikinabang, nirereklamo nila." Domingo's response was contradicted by Dr. Farrah Agustin-Bunch on her post in Facebook due to false information most especially on Domingo's claims that there are patients who also complain Dr. Bunch. "Philippine Institute of Alternative Health Care has to set standards, in this case it was being sold as medicine it requires a certificate of product registration. There was a meeting between Dr. Farrah Bunch and the FDA. Dr. Farrah has to settle the price being imposed and she may again apply for a license to operate her pharmacy and registration of her product that me be sold in the public. " Meanwhile, to counter explain Domingo's statement on Sen. Sotto's concern on Dr. Farrah's case. 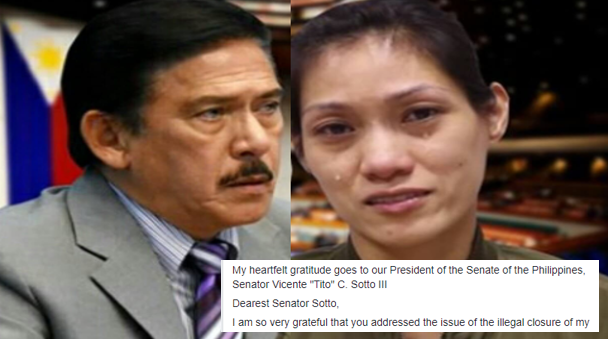 She posted in her Facebook post things to clarify on the question of Sen. Tito Sotto during the deliberations. I am so very grateful that you addressed the issue of the illegal closure of my facility by the combined union of FDA & DOH during DOH budget deliberations today. I’ve been begging and pleading for help and you answered the call and in doing so, many thousands of patients' prayers. You Sir were very well informed regarding the situation, including your knowledge of my product efficacy and extensive testing. I am overjoyed that the pleas of patients are finally being heard. There were a few serious issues during that meeting today which must be noted. 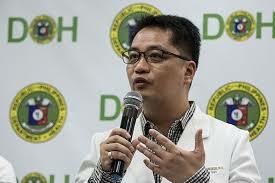 DOH USEC Eric Domingo falsely claimed that the complaint that originated to close my facility came from patients. You corrected him and properly noted that the complaint was filed against me by the Presidents of 5 separate medical societies. The Philippine College of Physicians, Philippine Rheumatology Association, Philippine Society of Medical Oncology, Philippine Society for Microbiology and Infection Diseases and the Philippine Society of Nephrology. They forum shopped their complaint around, which was denied at PRC since there was no aggrieved party. It was dismissed at DOH with no aggrieved party and no jurisdiction. It was reportedly denied at The Philippine Medical Association as well. Finally, they got a friendly FDA to do their bidding. This group of medical society presidents was led by Dr. Kenneth Hartigan-Go of Dengvaxia fame, who coincidentally is the former acting FDA Director-General. USEC Eric Domingo stated that I did not have a license to operate as a medical facility. He failed to mention to you that I’m not required to obtain a license to operate an outpatient medical clinic, nor is any other Doctor in the Philippines. He also failed to mention my facility is also my home. USEC Eric Domingo falsely claimed that I have a Pharmacy, yet 2 separate FDA raids demonstrated the presence of zero pharmaceutical products. Attorney Sig Fortun has clearly illustrated this in our suits against the DOH, FDA and Director General Charade Puno. Usec Eric Domingo falsely claimed that only the alleged pharmacy was closed at my facility. The entire facility was ordered closed. One needs to look no further than the FDA posted tarpaulin which clearly states that "The Dr. Farrah Bunch Natural Medical Center of Lot 9, Maluid, Victoria, Tarlac City is hereby ordered CLOSED..."
The FDA does not have the authority to close medical facilities under Republic Act no. 9711, also known as the FDA act. Yet that didn’t stop FDA Director Charade Puno from making it happen. USEC Eric Domingo falsely claimed there was a meeting between me and the FDA. My sister in law and one of my lawyers met with an FDA lawyer. USEC Eric Domingo falsely claimed that there was an agreement that had been reached. There has been no agreement reached at all. Was USEC Eric Domingo under oath when he made these statements to you? It was reminiscent of Director-General Puno’s misleading testimony in Congress about me while under oath. It seems that whenever FDA or DOH personnel get questioned about me and my situation under oath, that the truth just flies right out the window. Please ask Sec. Duque about the closure order that was approved for my facility on July 30th. It was widely disseminated online but never served. The problem is that DOH doesn’t have jurisdiction over outpatient clinics either. The enforcement officer from DOH knew this and refrained from attempting to enforce an unlawful order. Please ask about that. Senator Sotto, my facility was stormed and illegally closed by roughly 50 heavily armed men in a tactical “shock and awe” military style operation like I was a terrorist. It was a complete failure of due process and observance of our laws. The sick and hopeful became the helpless, the crying and the dying. This illegal gung-ho operation cost countless thousands of Filipinos the Universal Health Care they desire, that I was already providing to them for FREE in large part, since most of my patients are poor. I am so grateful that you are now investigating this travesty. Our government mandates of the TAMA Act of 1997 are directed at promotion and protection of traditional and alternative medicine in the Philippines, but practice is really just a joke. I’ve worked tirelessly to promote effective, natural treatment options for patients while everyone including PITAHC sits and watches the FDA used as a weapon of mass destruction for Pharmaceutical interests against me, with the PNP being the hammer that pounds the nail. I was fined over P1,072,000 (around $20,000 USD) and given a permanent revocation of my (LTO) License To Operate as a food manufacturer, without a single complaint having been received at FDA by a patient. But, FDA filed criminal charges against me. I’m forced to spend a fortune to sue the FDA for the illegal marching orders given by Mrs. Charade Puno while she gets to use government lawyers to defend her illegal actions. I’ve been forced into hiding because of death threats attributed by NICA sources to “senior FDA enforcers”, and the PNP still hasn’t investigated. Even Police Chief Sonny Silva of Victoria Tarlac hasn’t started an investigation in spite of the blotters filed and evidences given. I agree with the need for Universal Health Care for Filipinos. But, at the same time our citizens are aggressively being denied natural treatment options. Does this mean Universal Health Care should only be for highly profitable areas of medical and health treatment? Should the only participants be large hospitals and multi-national pharmaceutical companies? Why does the current draft of the National Integrated Cancer Control Act completely ignore natural medicine? How can we be responsive to the needs of the people if we limit their choices to profit driven treatments? Isn’t it time that Philippine innovation is lauded instead of shelved and hidden away? Why must we always follow the lead of first world countries, especially when they're wrong? Case in point: Dengvaxia. The Philippines bio diversity is a valuable medicine cabinet for the world. Isn’t it time we Filipinos took our rightful place as leaders in Medicine? I thank you for your time with all of my heart Senator Sotto. I also thank you for showing me how a real leader responds to those in need. May God bless you beyond compare. #WeSupportDrFarra#WeSupportNaturalMedicine #WeNeedBostonC #supportnaturalmedicine #hearourvoices #DrF #DrFarrah #drfarrahmd #cancercure #bostonc #NOtoMDivision #immunotherapy#naturaloncology#SupportDrFarrah #charadepuno"